October 13. 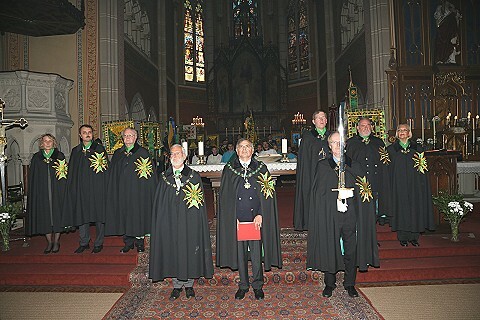 2012, the by then biggest investiture ceremony of the Lazarus Union Knighthood of Honour took place. This time the selected location was the parish church in Rudolfsheim in Vienna's 15. district. This church which resembles more a medieval cathedral than a mere church is famous for being mistaken for St. Stephen's Cathedral by many tourists who look over the skyline of Vienna from Schonbrunn Palace. At 2:30 the already almost traditional open-air concert of the Lazarus Union Music Corps tuned the guests in on the upcoming event. 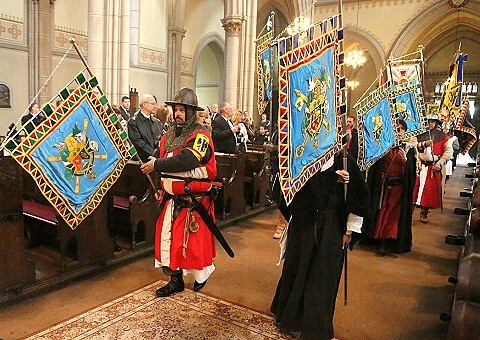 At 3:00 sharp a tremendous and grand procession (about 150m long) started to move into the church. The combination of various formations (relief organizations, associations, acolytes, historical military groups, etc.) immediately attracted the interest of the people on the square in front of the church. More than 250 guests had come to celebrate this event with us. 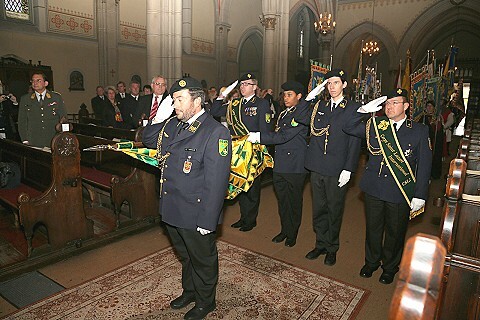 Of course this ceremonial event was accompanied by all officers of the CSLI honor guard commanded by CSLI Major Manfred Stadler as the commander CSLI Colonel Patrick Poppel was a knight initiate himself this time. But his deputy commander managed the task flawlessly. 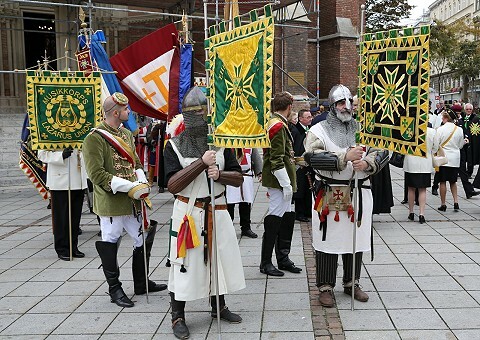 The new banners of the Knights of Honour were carried by standard-bearers in historical costumes showing various formations of the armies of the crusades. So a bridge was closed to the beginnings of the order of St. Lazare which recruited itself out of knights of Outremer suffering from leprosy, thus forming the dreaded "army of the living dead." 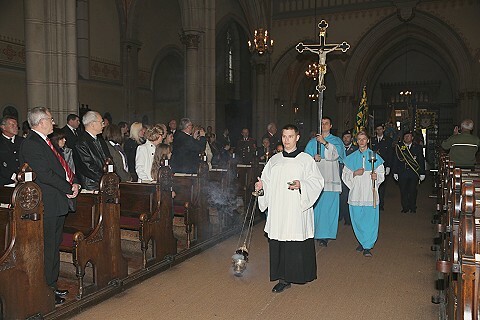 Officiant of the Holy Mass was Dr. Reinhard Knittel (Official of the diocese court St Pölten and vice-chancellor of the Franciscan church Prandtauerkirche). 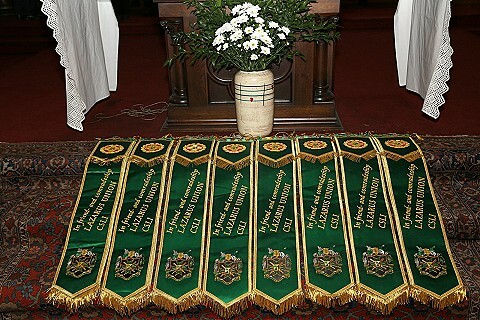 He celebrated the service (following the old Latin rites) with utmost dignity and solemnity. 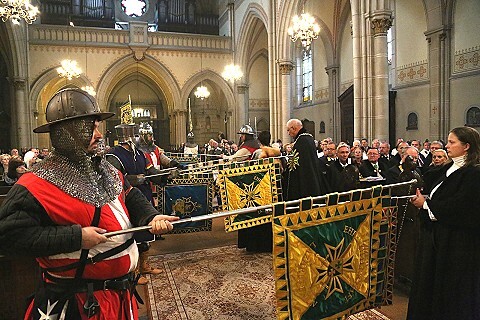 In his sermon he mentioned the knightly ideals, especially addressing "total dedication" as the ineradicable anchor of knighthood. 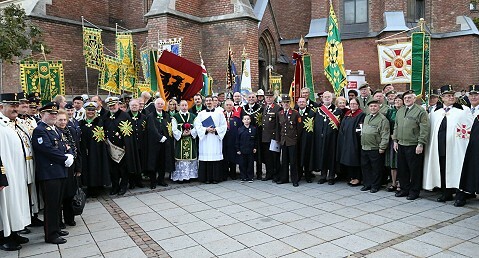 Support was provided by acolytes from Rudolfsheim parish, the Brotherhood of the HolyArchangelMichael, and volunteers from St. Stefen. 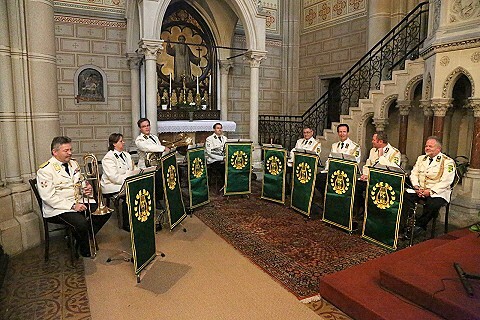 The musical framework was taken care of by the CSLI Music Corps conducted by CSLI Bgdr. Gen. Friedrich Lentner. The enormous organ was played by Mrs. Mag. Lusine Poppel who is well acquainted with local music customs (and is also a CSLI music officer). 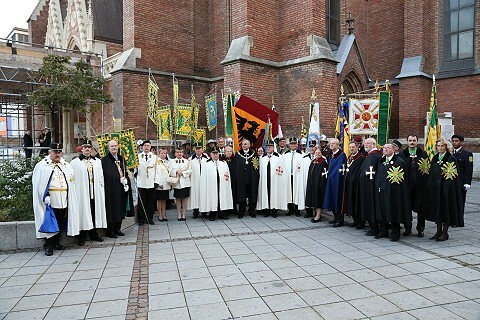 Delegations from many friend organizations visited the investiture, e.g. 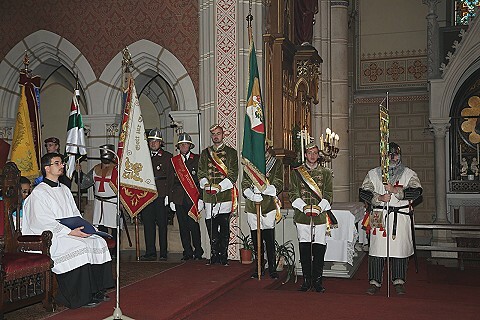 the Order of St Lazare, the Radetzky Order, Michaels Order, ÖKB Mödling, Austria Humanitas Corps, K.O.St.V. Rudolfina Wien im OCV, Prima Nocte, Milites Sancti Imperii, Spielern Fire Brigade, Red Cross, Army Engineers Society, Marine Comradeship Archduke Ferdinand Max, Ordo Hungariae, Sovereign Military Order of Malta, Peacekeeper, Veteran’s Society, delegations from the Austrian Army, Order of Joachim, Order of Cyprus, Order of the White Eagle und representatives of the diplomatic corps. 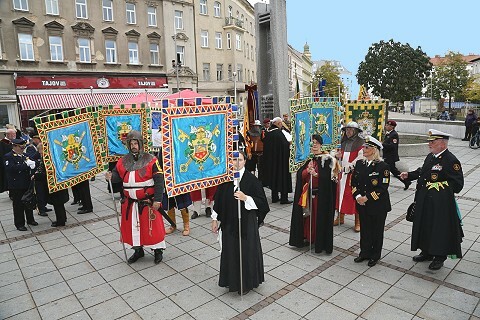 Altogether 23 banners and flags were to be counted which all received as a souvenir a wonderful embroidered flag banner as a sign of mutual friendship. Besides the investiture of six knights and dames of honour several promotions and honours were awarded, also to persons who showed extraordinary merits with their charitable work and performance. 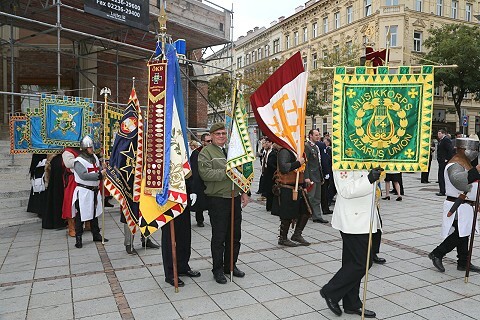 The standard-bearers in their medieval costumes drew special attention of all visitors and provided a worthy background for the ceremony. Following the investiture the Lazarus Union provided free drinks and sandwiches to all guests. Additionally the society of the friends of the Rudolfsheim church donated red wine as a worthy welcome gift to the Lazarus Union. It was a successful day which will be well remembered by all participants!